Marriage is hard. Parenting is hard. Friendships are hard. Relationships in general are just…hard! It’s been a very busy few months for the Gibson family. We’ve had a new house to make a home, a new community to explore and learn about, new schools to get our kids settled into, and of course, BIG goals to get off the ground in marriage and orphan care for Fellowship of the Parks. Chaotic doesn’t even begin to describe what our lives have been. But we are finally at the point where we can be together, relax, and enjoy each other. As things started to settle down for us, it seemed like the perfect chance for us to have a fun family night out together. And when we saw a gigantic sign with “Eat. Bowl. Play.” on it, I couldn’t resist pulling into the parking lot. An evening together at Main Event seemed like a fun-filled adventure for any family. Now, I should preface this by saying none of us are bowlers. Amateur would be a generous title. Even still, we couldn’t help but feel that competitive spirit come alive as we played, especially since Kari was bowling the game of her life. She was blowing up the lanes with strikes and spares all over the place. I didn’t respond. I was too focused to really consider showing mercy. Then she leaned back in and whispered, “If you let me win, I’ll …” (sorry that would be TMI). Bowling ball in-hand and mind swirling as I tried to figure out what to do, I took my position. The stakes were high: Go for the pin and reach for the thrill of victory, keeping my undefeated streak alive, or purposefully throw the game and give my wife the gift of being the champion bowler in our home? I blame my competitiveness. Whether it’s with board games, water balloon fights, or the classic “who can hold your breath underwater the longest?” challenge, I don’t let my family win at anything on purpose. If they win, they win it fair and square. Needless to say, I decided to go for the win. “What do I have to lose?” I thought. I figured it’s a win – win situation. If I miss, I can say I purposefully gave that one for my beautiful wife that I adore, and I can walk out being a romantic, sensitive husband. And if I hit the pin, I’m the bowling champion of the family. I marched forward, concentrating on hitting my mark, let the ball go and watched it make sweet, solid contact with the pin. I pumped my fists upward in triumph as if I had just won a gold medal. And then I turned around and locked eyes with Kari. I could see in her face that she was a little hurt. When I reached out to hold her hand, she brushed it aside. Of course, I looked around to make sure no one from our church was there to see their marriage pastor and his wife having a spat. We worked it out, of course, but not before I let her know I was sorry for acting selfishly. For me, the hardest part in a relationship is being humble and patient. As a competitive person, getting the “win” is important. It’s different in relationships, however, where “serving” is what defines a champion. Having a great marriage requires a straw hat, not a crown. When I put on a crown, I become self-centered. When I become selfish, I get easily frustrated because people can never meet my expectations. My relationships become about me, and those kind of relationships don’t last very long. 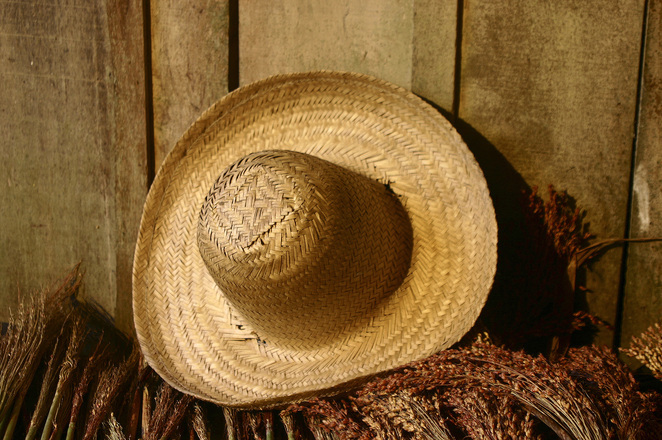 The straw hat represents a farmer. A good farmer is concerned about making sure his land has the right nutrients, sunlight, and water for his crops to grow and become a beautiful harvest. He takes delight in seeing his crops grow and be healthy. He’s intentional and willing to work hard. A bad farmer, on the other hand, will scatter some seed out and come back in a few months expecting to see a good crop despite doing very little work for it. He sees his land full of weeds and gets angry, blaming everyone and everything but himself for his dismal harvest. In marriage, what if we took personal responsibility for where our relationship is today? Whether good or bad, we can start thinking less of ourselves and more about how to love her or to respect him. Ask him – When do you feel most respected by me? Ask her – When do you feel most loved by me? The answers you receive will become your playbook on how to serve your spouse. Instantly, her heart was open and we were back on track to loving each other well. With humble hearts and a servant mindset, our relationships will grow to be vibrant and healthy. Here’s to being good farmers.